Oh what fun I've had. Wandering round the flat looking for unread books. I've realised (blush) that there are quite a few. #TBR20 was started by Eva Stalker in early November 2014. 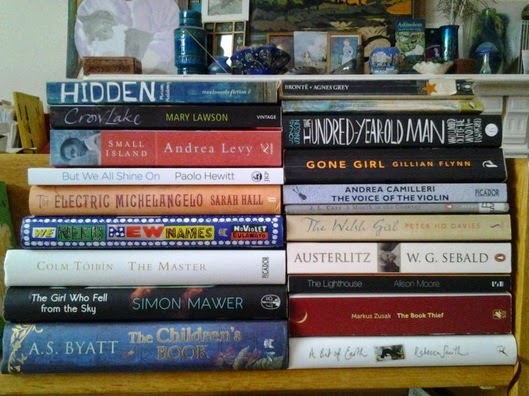 Eva began a project to read 20 books from her To Be Read pile before buying any more. There is now a group of readers taking part via the #TBR20 hashtag on Twitter. Here are my 20. I'm not sure what order I'll read these, but first up will definitely be But We All Shine On, Paolo Hewitt. I think I'll add one-for-luck in case I get stuck! My one for luck will be La Basquaise, Angel Strand, a Black Lace number from 1995. 1) Partner brought me a pile of Man Booker shortlists. I should at least attempt to read them so as to encourage him to buy me more books. 2) Saving special books for a time when I have nothing to do but read will probably never happen so I should read them now. 3) An Anne Bronte book that has sat on my shelves for 20 years gathering dust and recently condensation from its new place on the windowsill. It needs to be saved from mould and disintegration. 4) PhD supervisor's book so I can fling in bits of her text knowledge next time we meet and earn extra points. 5) Books I must read for the PhD, or if I don't get funding, the article I will write. 6) Books I've started and have been too lazy to finish. Now I will have to complete them. 7) I love a deadline so here's one for me. Easter 2015 - in 13 (gulp!) weeks time. 8) Christmas books from friends, always a welcome gift. 9) An experiment in remembering. A teeny tiny children's book last read when I was 11 years old. How much will I remember? 10) Mass production books that everybody else has read and mentioned at gatherings. A way to keep myself off Twitter and Facebook and get back to the wonderful art of getting lost in a good read. The only rule of #TBR20 is that you must read 20 books you own before buying more. The rest is up to you. Some people are avoiding library loans, too. Some of us are picking out the books in advance, and others are choosing as they go. If someone gives you a book as a present, that doesn’t count as a breach of the rules (unless, of course, you have browbeaten a friend into buying it for you because you feel that desperate for a new hardback. If you’re doing this, you’re a hopeless case and #TBR20 probably can’t help you). Follow the #TBR20 hashtag on Twitter or give Eva a shout in the comments – @evastalker would love to hear your thoughts on the project. If you’re taking part, let her know what books you’ve picked.